Kerry Blackshear Jr.K. Blackshear Jr.
��� Nickeil Alexander-Walker scored 12 of his 20 points in the second half, and No. 13 Virginia Tech beat North Carolina A&T 82-60 on Wednesday night for its fifth consecutive victory. 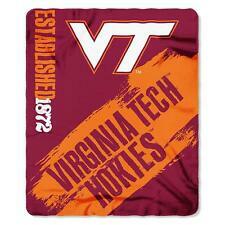 New NCAA Virginia Tech Hokies Large Soft Fleece / Throw / Blanket 50" X 60"